The mission of the College of Business is to achieve excellence in our undergraduate and graduate business programs. In pursuing this mission our objectives include: a) achieving excellence in business education by integrating academic scholarship and practical application; b) producing basic and applied research to enhance business analysis, practices and policy and; c) helping meet the economic challenges facing the state and region. Our degree programs are designed to prepare students to be successful in both private and public sector organizations throughout the state, region and nation. These organizations will be characterized by high rates of technological change, increasing levels of cultural diversity, and globalization of markets. The college offers baccalaureate and master of business administration degrees. The objective of the baccalaureate degree is to provide students with the knowledge and analytical skills necessary to succeed in entry-level professional positions in their chosen disciplines. The program is designed to prepare students for advancement into middle and upper management positions by providing breadth of knowledge in selected functional business disciplines, training in communication skills, and a solid foundation in the sciences and liberal arts. The objective of the master of business administration degree is to prepare students for managerial and executive positions. The college seeks to provide opportunities for specialized training and experience in targeted industries and functional areas. The E. L. Cord Student Success Center provides a full range of support services for current and prospective College of Business students. 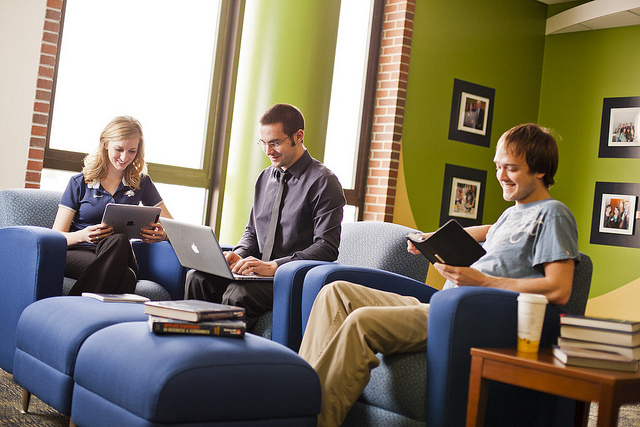 Undergraduate advising, graduate advising, and Career Connections are housed in the E. L. Cord Student Success Center. In addition, students may access resources to support academic planning and involvement in student organizations. Visit the E. L. Cord Student Success Center in Ansari Business Building, room 409, or for more information call the center at (775) 784-4912 or visit the website at: http://www.business.unr.edu. The College of Business’ Office of Career and Corporate Outreach offers students and alumni of the college assistance in career awareness, exploration, internships and employment opportunities during and after their academic careers. Students and alumni can get advice about the job search process including cover letters, resumes, interviewing, networking, business etiquette and career opportunities. Employers work with the College of Business directly to recruit for career and internship positions as well as special projects, research and other mutually beneficial activities. The office works with employers to achieve close matches between each company’s needs and student opportunities through a community job board. The Nevada Careers website is located https://www.unr.edu/business/nevadacareers. During the fall and spring semesters, the Career and Corporate Outreach Center schedules on-campus recruiting visits and interviews as well as a university wide Career & Internship Fair. The office schedules special events in order to provide opportunities for business student candidates and prospective employers to meet. The Nevada Small Business Development Center (NSBDC), established in 1985, is the state’s largest integrated business outreach program. It is the primary vehicle for the College of Business to deliver technical assistance to Nevada’s businesses and governmental communities. The NSBDC leverages its resources through our 14 offices statewide with programmatic and financial partnerships to apply business solutions to the real world. Relying on College faculty, staff, students, and external consultants, the NSBDC offers professional business consulting, providing practical, relevant advice to help current and prospective business owners, including minority and disadvantaged businesses, succeed. It offers workshops and classes to support entrepreneurs and their staff in starting, running and growing businesses. The NSBDC provides confidential assistance to Nevada business and government with environmental management and energy efficiency issues. It support Nevada’s underserved populations through the Imagine 2020 Initiative, especially by identifying and implementing efforts to enhance Hispanic entrepreneurial activities and provide stronger educational opportunities. Finally, it provides specialty support through programs such as Made in Nevada, Nevada Grow (Las Vegas), NxLeveL, and SBIR outreach. The NSBDC also houses the Center for Regional Studies, providing economic and demographic analyses with the most current and accurate small area data (using GIS as a tool) to research our region. These analyses help businesses select locations, understand market trends, and predict growth, and they assist non-profit agencies, governmental entities, and regional decision-makers. The Ozmen Center for Entrepreneurship is part of the College of Business at the University of Nevada, Reno, but its vision reaches across the entire university as well as the community. Vision: to develop entrepreneurial capacities and foster the creation of ideas and new enterprise among students and faculty of the University of Nevada, Reno and members of the Northern Nevada community. The Ozmen Center is a point of inspiration and a clearinghouse for information, an idea space that facilitates entrepreneurship, moving ideas into action. The Ozmen Center facilitates the development of entrepreneurship academic courses, professional education and training. It also manages the Sontag Entrepreneurship Competition, which makes an annual award of $50,000 to the winning UNR student team. Other programs include the Women’s Entrepreneurship Initiative, Pack Pitch, and live streaming of One Million Cups. The Center was founded in 2014 and was made possible by a gift from Eren and Fatih Ozmen who are exemplary entrepreneurs and alumni of the University of Nevada, Reno. Headquartered in Sparks, Nevada, Sierra Nevada Corporation is a privately held company under the leadership of Chief Executive Officer, Fatih Ozmen and President, Eren Ozmen. The College of Business’s baccalaureate and master of business administration programs are fully accredited by the Association to Advance Collegiate Schools of Business. The baccalaureate and masters programs in accounting are also separately accredited by the Association to Advance Collegiate Schools of Business (AACSB). The College of Business at the University of Nevada, Reno will accept upper-division courses from business schools that are fully accredited by the Association to Advance Collegiate Schools of Business (AACSB). Other courses will be evaluated on a case-by-case basis. Baccalaureate Degrees: (a) Bachelor of Science in Business Administration with majors in accounting, information systems, accounting/information systems, economics, general business, finance, international business, management and marketing; (b) Bachelor of Arts with a major in economics. Coursework Older Than 10 Years: Coursework used to complete College of Business, Major, and/or Minor requirements must have been completed within the 10 years prior to the year of graduation. A student may submit an appeal for course work that they believe to still be relevant to the College of Business Student Success Center. Courses under appeal shall be reviewed by the department offering that course and by a student’s major or minor department. Departments may approve, disapprove, or request that the student revalidate the substance of such courses. Minors: The College of Business offers undergraduate minors. Students may minor in business administration (non-business students only), accounting, information systems, economics, economic policy, entrepreneurship or gaming management. All minors are to be completed with an overall GPA of 2.0 or higher and include a minimum of nine credits upper-division (300 and above) coursework. Master’s Degree(s): (a) Master of Business Administration, (b) Master of Science in economics, (c) Master of Science in finance, (d) Master of Arts in economics, (e) Master of Accountancy, and (f) Master of Science in information systems. Doctoral Degree(s): (a) Doctor of Philosophy in economics. New undergraduate applicants to the College of Business are admitted to premajor status rather than to a specific major. Premajor-major students may not enroll in College of Business courses numbered 300 or above. Students must meet with an academic advisor in the College of Business Undergraduate Advising Center to declare a business major. Completion of 60 credits or more with an overall grade-point average of 2.0 or higher. ; IS 101 ; ECON 102 ; ECON 103 ; ECON 261 ; ECON 262 ; MATH 176 ; MKT 210 . These requirements are minimum standards that all students are encouraged to surpass. Success in a major program is dependent upon a student possessing strong quantitative and English usage skills. 30 upper-division units must be earned in residency at the University of Nevada, Reno. Complete all Silver Core Curriculum requirements. NOTE: See the “Requirements for Graduation” section of this catalog for more information. All College of Business (COB) correspondence and independent study courses approved by the COB curriculum committee can be applied toward the College of Business major and minor programs. The bachelor of science in business administration degree is granted upon completion of any one of the following four-year curricula with satisfactory grades and upon the recommendation of the faculty and the dean. An economics major may elect a program leading to the bachelor of arts degree. Deadlines for applying for graduation are set by the university and are published each semester in the class schedule. In the case of re-entry after five years, a student must use the requirements of the year of re-entry or graduation only. For more information, please review the Catalog Year section in the catalog. business students who have been accepted to a major or minor. nonbusiness majors who have officially declared a business minor or with the approval of the instructor and department chair. Students in the College of Business may apply a maximum of 15 satisfactory/unsatisfactory (S/U) credits, including College Level Examination Program (CLEP) credits toward the baccalaureate degree. Physical education and military science credits are excluded. Pre-business or major students may not register for courses in business administration or the University Core Curriculum on an S/U basis except for thesis or internship. Students may meet the foreign language requirement by completing course No. 209 or 212 in any language. A maximum of three (3) credits may be applied to major requirements from these courses. An equivalent graduate-level quantitative course may be substituted.